Performances by Paul Dean and Stephen Emmerson, two of Australia’s most poetic instrumental soloists. 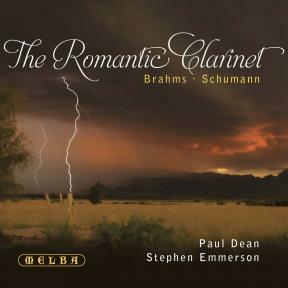 The profundity of Paul Dean’s musical expression coupled with the magnitude and breadth of his instrumental palette make him a worthy interpreter of Brahms’ tumultuous Clarinet Sonatas. 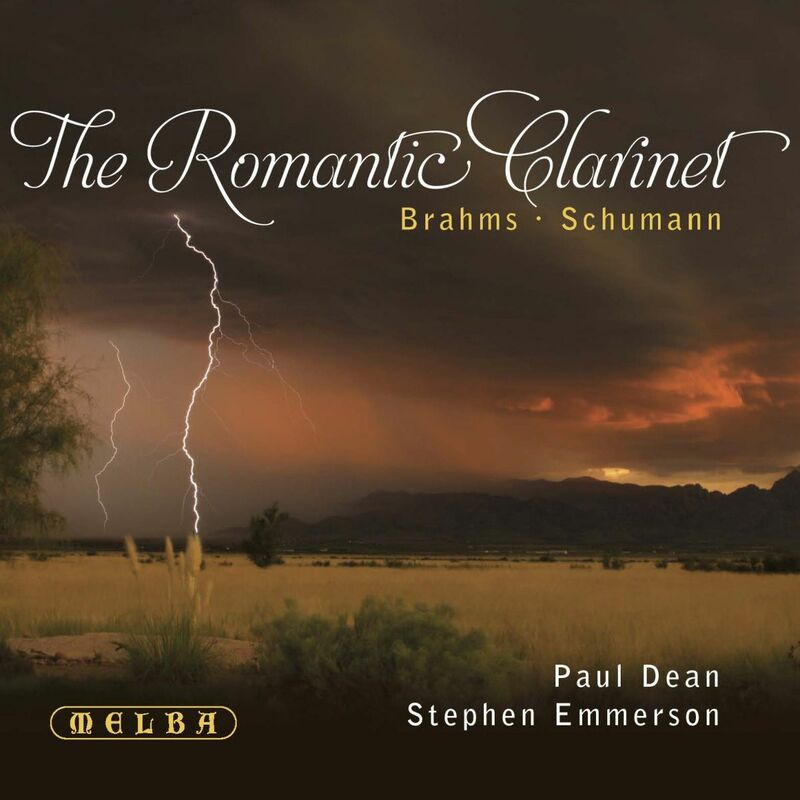 Dean and long-term collaborator Emerson draw from Brahms’ Clarinet sonatas an emotional range beyond the imagining of most instrumentalists. The emotional turmoil and complexity inherent in these pieces paint a fascinating picture of Brahms emotional state as he approached the end of his life. In the Op.120 Clarinet Sonatas Brahms fulminates and rages against the dying of the light; at his waning vitality, yet in turn these sonatas offer up tender episodes, finely spun passages seeming to portray a melancholic acceptance of mortality. Dean offers a simpler realization in transcriptions of three songs from Brahms’ Op. 57 Lieder und Gesänge revelling in the unparalleled sensual beauty of his tone and phrase in these affecting songs. Paul Dean, as Artistic Director of the Australian National Academy of Music, the country’s peak music institution, is also the trusted mentor to the emerging generation of Australian musical talent. At the Queensland Conservatorium Stephen Emmerson teaches a range of courses in music literature as well as piano, chamber music and performance practice. He convenes the Doctor of Musical Arts program and is a member of the Conservatorium Research Centre. With its antecedents deep within the Middle Ages and the Middle East, the clarinet, with its evocative, soft-focus chalumeau bottom register, has long exerted a siren-like attraction on composers, calling to them alluringly and irresistibly, particularly, it would seem, in later life. Like Mozart before him and many others afterwards (Reger and Poulenc spring readily to mind), Brahms came belatedly to the instrument, or, perhaps, more accurately, to an appreciation of its full and varied character. Although he had always treated the clarinet with relative sympathy in his orchestral music, Brahms was 58 and newly emerged from short-lived retirement when he first wrote music that specifically showcased the instrument in 1891: the introspective, shadow-cast Op. 114 A minor Trio with cello and piano, and the magisterial Op. 115 Quintet, a work of bewitching autumnal beauty. Together with the two Op. 120 Sonatas, composed three years later, Brahms, with just as many years left to live, took his leave of chamber music. As all four of the clarinet works were, the Sonatas were written for and dedicated to Richard Mühlfeld, principal clarinettist with the Meiningen Orchestra in central Germany, with whom Brahms had developed a close friendship after hearing him perform Mozart’s Clarinet Quintet and Weber’s Clarinet Concerto. Weber’s pioneering championing of the clarinet as a solo instrument – for which he wrote two concertos and, up until his death in 1826 and for many years after, more works for it than any other composer – was also to have a direct influence on Brahms. Significantly, the keys of his two sonatas, F minor and E-flat major, are identical to those Weber employed for his concertos. Both sonatas echo the sense of lengthening days and the deepening awareness of the ineluctable finality of things – the dwindling of creative inspiration and the slow, inexorable dimming of living and life – that is clearly in evidence in the Quintet. But they also offer a vivid reminder, not least in the way both seem to fulminate and rage against the dying of the light, of the life-enhancing vitality and vivacity of the composer in his youth. Although the abiding image of Brahms that has been handed down to posterity – of the aged, grizzled and gruff elder, “rather taciturn and jerky as a rule and notoriously difficult to carry on a conversation with,” as Dame Ethel Smyth once ruefully observed – continues to colour our view of both the man and his music, Brahms in younger days was a very different character altogether, as a letter by Robert Schumann’s daughter Eugenie describing his athleticism on a landing banister strikingly illustrates. A lifetime later, the melancholytinged, eulogy-accented Clarinet Sonatas seem to look wistfully back to the now long lost virility of his youth and to sound, for all the world, like a reluctant but resigned leave taking of the dull, inactive stasis of older age. Such a sentiment seems to be explicitly echoed in the fine-spun melancholia of the Sonata’s opening, the clarinet at first stubbornly refusing entreaties from the alert piano with glowering indifference. In the often surprisingly animated giveand- take that follows – which nimbly takes Brahms’s Allegro appassionato marking at face value – the sinewy undulations and spirited arabesques of the piano seem briefly to call to mind the lithe acrobatic athleticism once witnessed by Eugenie Schumann, the memory prompting increasingly supple responses from the clarinet. The second movement begins in more reflective mood, the earlier exuberance clearly exhausted and replaced by languid dreaminess that is borne aloft by a single melody. The result is something altogether more ruminative: the piano noticeably plainer, the clarinet introspective and almost improvisatory in its pensiveness. Echoes of the earlier Brahms are to be heard in the silky gracefulness of the Allegretto grazioso third movement – whose second, Ländlerlike theme has an obvious affinity with that of the sixth Op. 116 Intermezzo, the lilting ballet between piano and clarinet appearing to offer a touching re-enactment of even earlier memories. The buoyant Vivace finale is a considerably more exuberant affair, the interplay between the two instrumental voices enlivened by spirited reciprocity in writing that places each on an equal footing. The shorter Second Sonata, with its valedictory-sounding slow last movement, shows Brahms, on the verge of 60 and beginning to feel his age, nonetheless able to develop a more concise and sophisticated employment of the clarinet with all the agility of his much younger mind. Tranquil and terse in equal measure, the sonata again treats both instruments democratically – indeed, if anything, more so than its predecessor – while also exhibiting a more pronounced sense of accommodation and ease; a relinquishing, it might be tempting to surmise, of the burdens of a life spent composing by a notoriously difficult-to-please personality who had been his own sternest and most strident critic. Breaking the surface throughout is what the critic Max Harrison referred to as the work’s “subterranean passion”, an impression underlined by meticulous piano writing pulsing with knowing vitality and shot through with silvery, darting slices of brilliant, captivating beauty. The clarinet, too, quickly acquires a characteristically evocative demeanour, not least in the measured atmospheres of the Allegro appassionato middle movement, another intermezzo in all but name. Here it enters into a languorously affectionate reminiscence with the piano that is worked out with sagacious aplomb in a set of theme and variations in which, significantly, only one of the six is cast in a fast tempo that concludes with a beguiling blend of the playful and the poignant. The voice had always been as important to Brahms as the clarinet became. It was one of the first instruments he wrote for, and, with his Vier ernste Gesänge (Four Serious Songs) in 1896, also the last. Originally written for piano and voice, and published in 1871, the Op. 57 collection of eight Lieder und Gesänge is one of only three pieces by Brahms (Die schöne Magelone and the Vier ernste Gesänge the others) that set texts by a single author. The poet and philosopher Georg Friedrich Daumer provided Brahms with lyrics for the two sets of Liebeslieder- Walzer composed in 1870 and 1875 and, although grouped together, the Op. 57 songs were written at separate times. It is possible that the three songs included on this recording were composed during or possibly before the summer of 1868. Certainly, their provenance falls no later than the autumn of 1871. Particularly distinctive about them is the obvious independence of the piano accompaniment from the dolorous ache of the music assigned to the voice, a quality that translates to the expressive, vocal qualities of the clarinet in the arrangements heard here with affecting ease. The languorous yearning of Es träumte mir, ich sei dir teuer (I dreamed I was dear to you) speaks with diaphanous delicacy of younger, less secure and more exposed emotions and seems likely to have been inspired by Brahms’s feelings for Clara Schumann, whose name is alluded to in a motif for the voice (clarinet) early on. In sharp contrast, the compact Ach, wende diesen Blick (Ah, turn away thy gaze) is a more obviously agitated expression of conflicted devotion. Unbewegte laue Luft (Motionless warm air) marries both the distracted sensuousness of Es träumte mir and the agitation of Ach, wende diesen Blick to spellbinding effect, with the clarinet’s inimitable capacity for sweet-sour keening coming cogently into its own. There can have been few more intense and intimate relationships than that between Brahms and the Schumanns. Composed in 1851, Robert Schumann’s Drei Fantasiestücke (Three Fantasy Pieces) followed within months of, and seem to flow from, the same creative source as the Third Symphony ‘Rhenish’ and the Cello Concerto. They begin with a backward glance to the earlier Op. 12 Fantasiestücke and a quotation from its fifth movement, In der Nacht, and a coincidental premonition (given the two composers were yet to meet) of later Brahms. There’s a comparable cross-cutting undercurrent, too, in the emotional warp and weft – given sublimely knowing voice by the clarinet – of the occasionally abrasive relationship between the lifting melodic disposition of the second piece and the grounded prose of the concluding section – a conflict that Brahms would surely have recognised and responded to with feeling and favour.